Brick By Brick Building Updates: Building Progress!! We are thrilled to tell you about how quickly St. Dymphna’s School has grown since our trip to Tanzania in January of 2008. Mary, the director of the school, has recently sent us many new photos and we wanted to share our sense of pride with you in hope that you will feel the same way. It is only through your continued support that this project has been able to become what it is today…a functioning school for special needs children in Tanzania. As you see will from the photos below the second building is almost complete and is now home to one completed classroom, a storefront and functioning bathrooms. Yet to be completed in the second building is the classroom for continuing education for special needs young adults where these students will be taught how to cook, make various curios and sew. All of the products made in the class will be sold in the school store. The store will function to not only help sustain the adult education project but also the experience of selling goods will be a learning opportunity for students striving to gain employment in the future. The third building continues to grow. 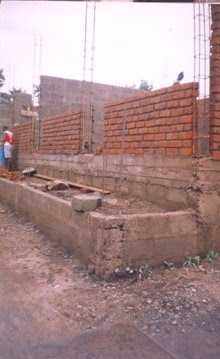 Currently the foundation and walls are completed for the first floor of the building. This building will consist of classrooms, bathrooms and a kitchen. The best news of all is that we now have ten children attending school daily at St. Dymphna. Our goal of providing a safe place for special needs children to learn and grow is being realized even as the building continues to grow around them. Mary and all of the children are incredibly grateful and asked me to pass along their appreciation. There is still much work to be done, but I hope that you agree that with your help, we’ve accomplished a great deal. Thank you again for all of your support. Through your contribution to Brick by Brick you are truly saving lives.